ROAD TOWN, Tortola, VI- No! It’s not a take over of the Virgin Islands (VI) by the British, an idea many critics of the ruling National Democratic Party (NDP) Government have been advocating for months. 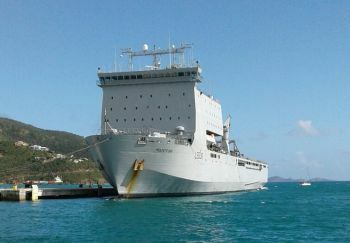 The Royal Fleet Auxiliary (RFA) Mounts Bay, a British military ship, has returned to the British Overseas Territory of the VI on a routine visit. It had come to help the Territory before, just after the devastation of hurricanes Irma and Maria in September 2017. The ship returned on January 12, 2018 and is expected to depart on Monday January 15, 2018. In September of 2017 when the ship came to the VI shores, at a time of great need for the islands, it brought drinking water and other aid. On Virgin Gorda, RFA engineers worked for hours assisting with the BVI Electricity Corporation's power station. In addition, while in the VI last year September 2017 immediately after hurricanes Irma and Maria rendered the capital city, Road Town, a ghost town, Mounts Bay sailors delivered masses of plywood, 75 sheets of corrugated iron, 100 planks of timber, a couple of wheelbarrows and an assortment of hand tools to help with the cleanup efforts. 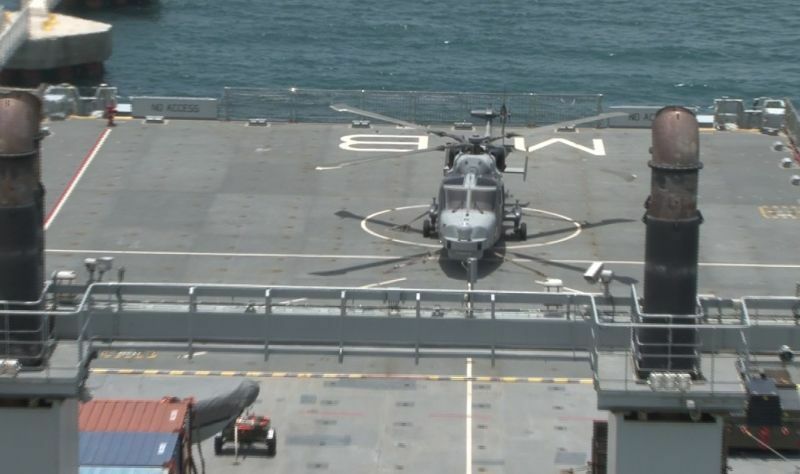 In September 2017 the ship’s Wildcat helicopter spent hours in the VI skies, either delivering supplies – fresh water especially – or transporting personnel ashore. This included flying in emergency supplies, such as three tonnes of bottled water and a half a tonne of food, to residents of Jost van Dyke, an island with a population of 300 plus residents. Why is the ship back? On this trip, the RFA Mounts Bay will be assisting the Department of Disaster Management (DDM) on a number of clean-up projects this weekend January 12-14, 2018. Crews from the ship will work on cleanup at the DDM Office building in MacNamara on Tortola, as well as realignment of the Cane Garden Bay siren, and debris management and painting of buildings at Elmore Stoutt High School, according to a Governor’s Office spokeswoman, Maria Mays. The number of sailors onboard the ship is not immediately known. @Wize up, I must say, i dont always agree with some of your comments but i hâve to agree on this one. I dont know what planet Alvin C think he is living on. INVADERS ? LOL. @wize up... I disagree with your statement about it being rightfully and lawfully theirs. They came and took the land. If someone comes and steals your house, is it rightfully theirs? True true they are our landlords NOW. It is actually all my land and I want to know when you are going to hand it back! Heya Howya, Heya Howya...was wondering the same thing! You think British are bad? Wait until Chinese get hold of more than Beef Island!!!!! You are so right. That place need totally demolishing and building an structure that is modern. Digicel CCT MERIDIAN INFINITE MEADE VI MOTORS HARNEYS VP BANK just a few suggestions on companies who need to show up with donations and give back. RTW TICO KMARK FOODS come on now give back some of what this community has given you for several years. And we thank you for all the help you have given us. You are welcome here again. thanks for the assistance rendered and you continue to give. BVI ? Sounds more like Devils Island to me. Truly I am one of many who wish they had come to take over as the current government has been a clear failure and must be removed until a next election. @ ??? , it cant bring anymore disaster to a place That has been filled with disaster for years. Tortola is So corrupt and evil, nothing IS going to help You all. Was so used to using the generator, that when electricity came back on this week, I automatically went and turned on the generator this morning. Man, they really have me all screwed up. Same thing happened two weeks ago when they turned on the water, kept using my water hose from the water tank....gee whiz. @ Marlisa: we have medication for that!!!!! !stop by the main hospital and get a check up just walk with the NHI Card!!!!!!!! RFA Mounts Bay captain and crew, welcome back to help us (VI) with the recovery effort incident to the damages inflicted by Hurricanes Irma and Maria. Clearly, we are still cleaning up four months after the severe hurricane onslaught. We should have been further along with the clean up effort but it is what it is. In regards to painting at Elmore Stoutt High School, why are we wasting time and painting any building on the campus? All the buildings need to be demolished and a modern and functional campus designed that maximized the use of the space. Let’s not forget to test for and remediate any asbestos in the building before taking the wrecking ball to them. In a twisted way, the hurricanes did us favour by making the decision for us so let’s take advantage of it. Captain do you have any Boats Swain Mates aboard? If so can you lower them over board to paint the rusting anchors. The rust is making us Boats look bad and we got an image to protect. Lol!